This cool and colorful surprise tye dye cake form How to Cook That is a bright dessert that will steal the heart of anyone who sees it. This is a great cake to tackle if you are a beginner baker and want to make something showstopping. 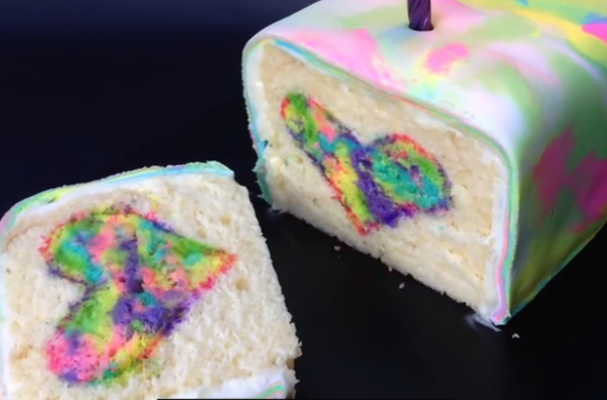 The cake decorating tutorial below shows you how to conceal a neon tye dye heart in the the middle of a loaf cake. If hearts are not your thing, you can easily switch it for another shape, letter, or even a number because the technique is more or less the same. First, you will bake a tye dye cake. The easiest way to do this is to use a boxed pound cake mix and then divide it up into five separate bowls and color each one a different neon hue. You can certainly use your favorite pound cake recipe as well for this. It is important to make a pound cake as opposed to another type of cake because it is dense and will hold its shape better than a lighter cake. Once the colorful cake is baked and cooled, remove it from the pan and use a cookie cutter to cut out the desired shapes. To finish, prepare more cake batter and pour some into a loaf pan. Then, line up the rainbow shapes as straight as possible and cover with the remaining white cake batter. Once the whole cake has been baked, frost with your favorite vanilla icing and shape the tye dye fondant over the entire cake. This cake can be adapted to match any event whether it's a child's first birthday, holiday, or something to bake just for fun. You can switch up the colors too, to coordinate with the party theme. This multi-colored cake is a must-make for anyone who loves a fun dessert dressed up in a rainbow.